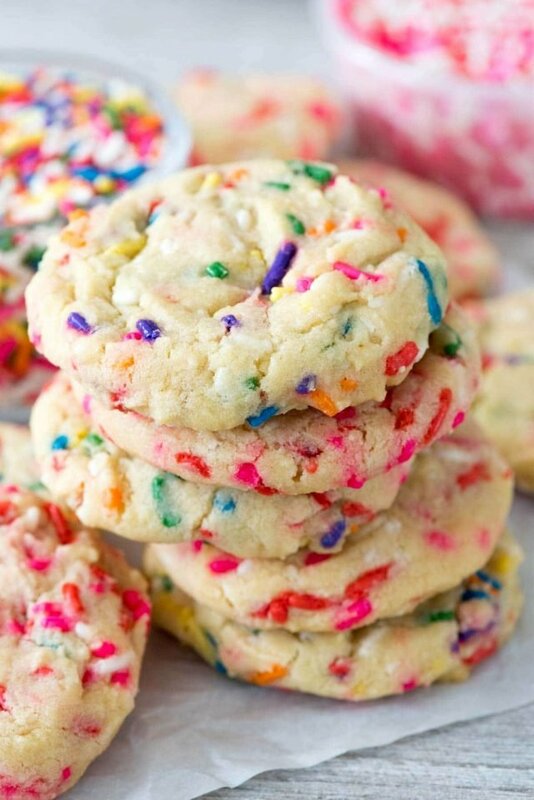 Every time I make these cookies, be it for 4th of July or Christmas or any party, they always disappear first. I recommend making a double batch! Now that Jordan is 13, Easter has become kind of … boring in our house. We’re not church goers, so Easter has always been about the bunny and egg hunts. But now that the Easter bunny is out of the bag, so to speak, it’s not as fun anymore. That’s why, this year, I decided to host brunch instead. We don’t have a ton of family around, and the family we do have is more interested in hanging out than going to church, so brunch for all! I’m going to invite any of our local friends without plans and we’re going to have quiche and cinnamon rolls and a mimosa bar….and cookies, of course. Even though we don’t traditionally celebrate Easter, I am in love with the holiday aisles at the grocery store. The day after Valentine’s Day I’m impatiently waiting for all the spring pastel candy and decorations to be set up, which I know is a #foodbloggerthing and the rest of the country is annoyed that we rush from holiday to holiday. The second that Easter M&Ms landed on the shelves I brought two bags home with me to make these cookies. Jordan has been on my case for a month about opening and eating them and I’ve been holding her off, just barely. 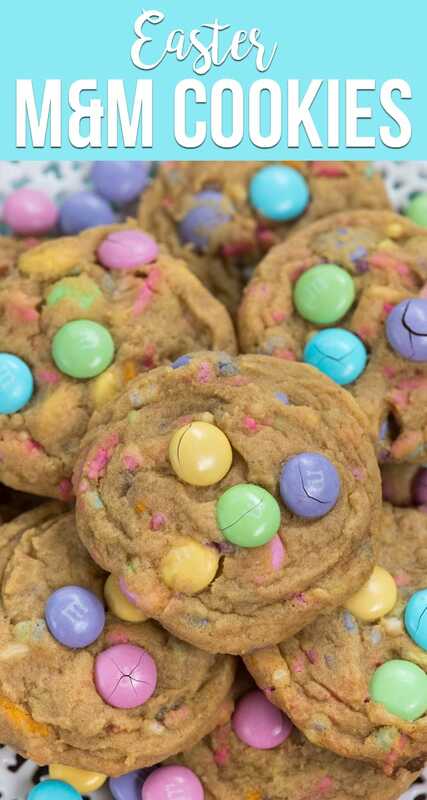 These pudding cookies combine my love of holiday M&Ms and sprinkles and my love of pudding cookies: Easter M&M Cookies, perfect for a class party or brunch or just because you love shopping the holiday aisles as much as I do. These M&M Cookies are made with butter and lots of brown sugar and my secret ingredient: pudding mix. If you’ve never tried pudding cookies you MUST! I can never get enough of them. If you love soft and chewy cookies, then you must try pudding cookies. I’m not a crunchy cookie lover, unless I’m eating Famous Amos cookies or Oreos. When I bake cookies I want them to be soft and chewy and full of brown sugar. 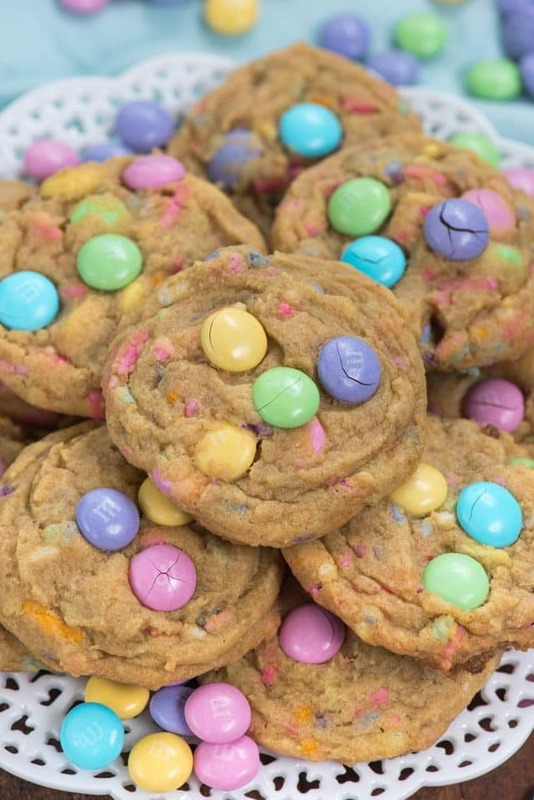 These fit the bill: a soft and chewy M&M cookie made perfect for Easter. After all, who can say no to colorful M&Ms and sprinkles???!!! 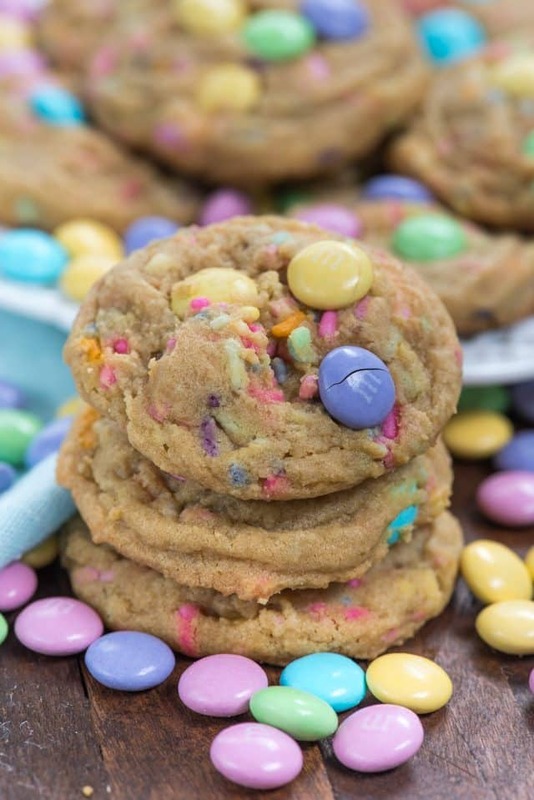 Easter M&M Cookies are perfect for spring! 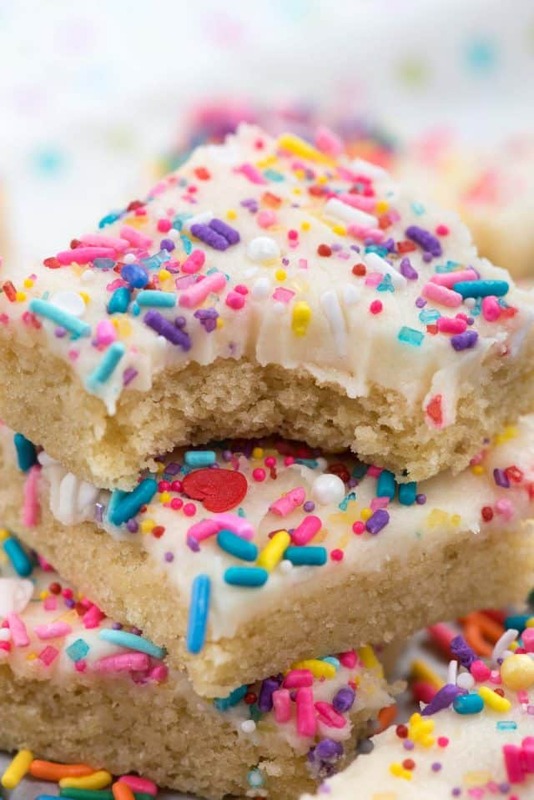 This easy pudding cookie recipe is a soft and chewy cookie full of pastel M&Ms and sprinkles. They’re always the first cookie to disappear at any party! I like to use butter, not shortening, in my cookies. Use unsalted butter to control the amount of salt. Make sure to use instant pudding mix, not the cooked kind. I prefer regular instant pudding, not sugar-free. Add the powder to the cookie dough (no need to make actual pudding). You can use any candy you want, I just love using M&Ms and sprinkles. For sprinkles: I suggest “jimmies” not nonpareils or drops or anything like that. Jimmies hold up better in the oven. Pudding cookies are not only soft and chewy, but they stay soft for days…but they’ll never last that long in your kitchen. Betcha can’t eat just one! 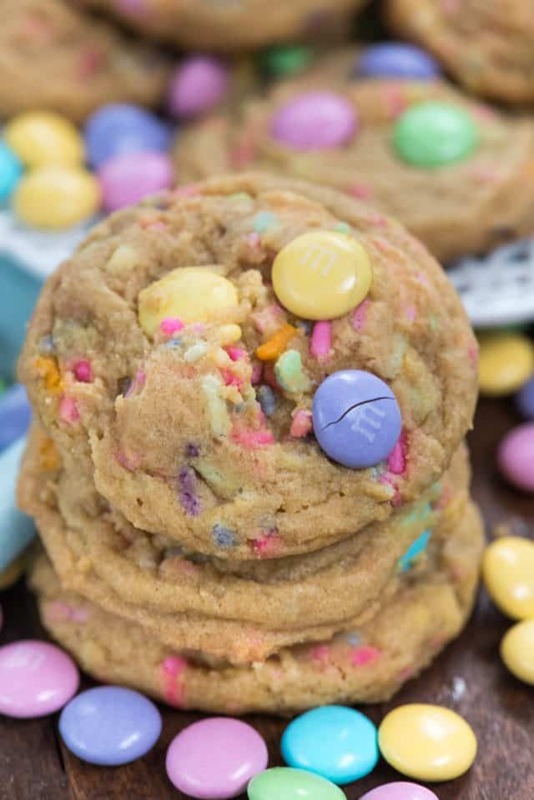 Make Easter M&M Cookies for spring! 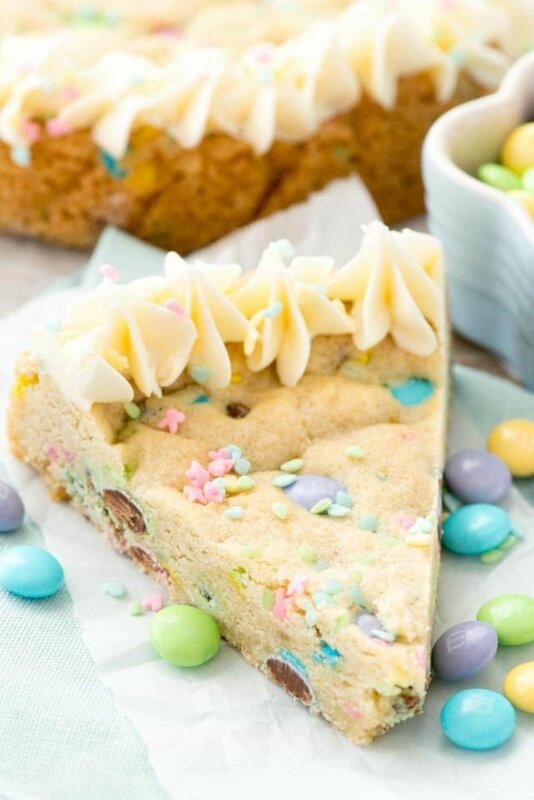 This is the best pudding cookie recipe filled with Easter M&Ms and pastel sprinkles. They're the perfect Easter treat! I absolutely adore pudding cookies. You can see all my pudding cookie recipes here, or check out Maria’s Chocolate Pudding Cookies, Aubrey’s Butterfinger Pudding Cookies, or Deborah’s Cookies ‘n Cream Pudding Cookies! Brunch at the house with a mimosa bar sounds perfect! And pudding cookies are the WAY to go! These look yummy as always. What time is brunch? I’m always checking the stores for the seasonal candy aisles way ahead of time! I always leave with at least one bag of something! My dear friend, if you do not believe that Jesus died on that cross as sacrifice for the forgiveness of our sins, then you have no reason to acknowledge Easter. That is what Easter is all about. I hope that you will think about the real reason we celebrate that day and explain to your son why there is an Easter to celebrate! We are forgiven, the cost was paid on that cross. Now we have a choice to accept that forgiveness and acknowledge that Jesus Christ is the Son of God who paid that debt on our behalf. Begin a relationship with God by asking him to help you get to know him. Read the Bible. Seek out others that you trust and respect who share their faith with you. Barb Settles – inappropriate comment! Don’t judge!!! These are – hand down – the very best cookies!!! I’ve made them about four times and each time they turn out awesome!! I will make them even after Easter, just switch out the M&Ms!! Thanks for an awesome recipe!! I did not add the sprinkles to these cookies and that appears to have made an awful lot of difference. I had to cook the cookies 20 minutes vs 9 – 11 minutes. And even then I had to use a fork to smash the cookies down as they never lost their ball shape. They are ok but somewhat dry. Again would the sprinkles really have made that much difference?